Studio 75 was an artist run project which I co founded, a gallery and project space on an East London housing estate. Winner of the 2012 UAL Enterprise Award. STUDIO 75 was about reinvigorating the idea of the artist-run space, and the old collective spirit that generated such a wealth of great art in the 60s and 70s. DIY curator. I’ve always been a great believer in DIY culture. Fanzines, DIY gigs, underground clubs and screenings – that’s how I spent my teenage and college years. I got involved in curating because there were shows I wanted to see and nobody was putting them on. Luna Nera was an artist-curator organisation I started the summer after film school, with some of my university friends and other artists I knew. Our first action-space was a derelict Victorian theatre, where we mounted several exhibitions and ‘happenings. Interested in cities and their liminal spaces, we as Luna Nera aimed to stimulate interest in the environmental and architectural heritage of localities. We wanted the audience to re-look at sites in a new way, and or projects focused on ideas of society, community, history, memory and public space. Luna Nera was concerned with exploring the conjunction of theory and practice in site-specific/site-responsive exhibitions and films, through a series of projects that also included text, talks and workshops. Curated by Gillian McIver. Lead artist Julian Ronnefeldt. Host NCCA St Petersburg. Kronstadt Connection was two site-responsive project undertaken in Kronstadt, Russia. The projects were based on periods of residence on the island together with in depth research about the unique history of the place, and the peculiarities of its landscape. The first project, Cross Encounters, which took place during the 300 year anniversary of the nearby city of St Petersburg, was about the arrival, the immediate impression, exploring the differences and coming to terms with what we found. The second project, Interconnection, which was timed to coincide with Kronstadt’s own 300 year anniversary, delved deeper, and focused on its role in the history of communication, as the site of the first ever working radio broadcast. A site-responsive art intervention into one of London’s grandest and most interesting derelict spaces: the former Midland Grand Hotel at Kings Cross, on the eve of its regeneration into the St. Pancras Renaissance Hotel. 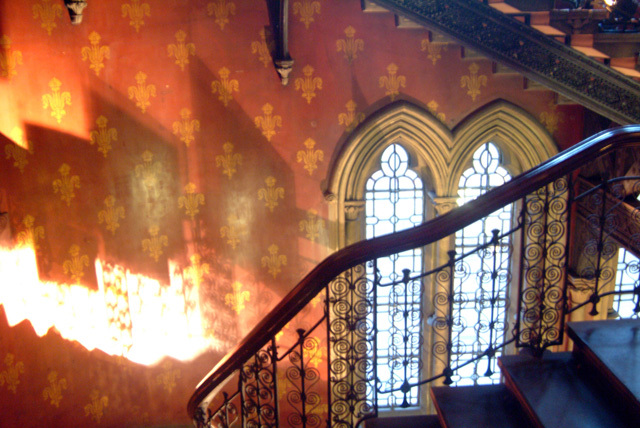 The Midland Grand Hotel, St Pancras was opened in 1873 as the grandest hotel of the British Empire. For the next half century it served the travellers of the St Pancras and Kings Cross railways. In 1935 it closed its doors forever and since then mouldered away in a state of semi-dereliction. It has now been restored to be once again one of London’s grandest hotels.’The Derelict Sensation’ presented a wide range of art forms, taking over this decaying magnificent space to create an urban art intervention into the fabric and history of the space.supported by the Arts Council of England and Awards for All. Curated by Gillian McIver of Luna Nera and featuring the artists of Luna Nera. 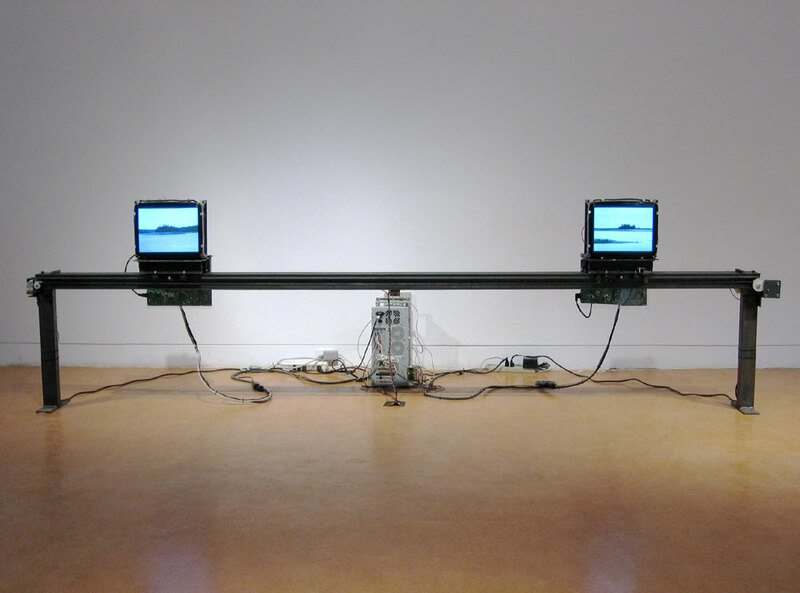 A solo show presenting the work of the Montreal-based media artist, featuring his most striking robotic and electronic installations. Curated by Heather Corcoran, Michelle Kasprzak and Gillian McIver. 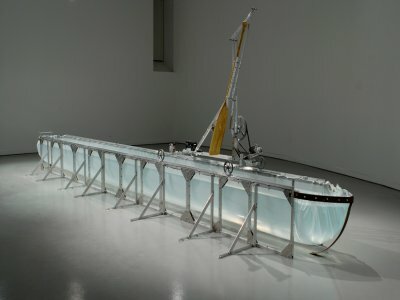 Eric Raymond has been active in the field of electronic arts for over a decade, having exhibited widely in Canada and internationally, including the Absolut LA International Biennial Art Invitational (US) and Ars Electronica (Linz, Austria). Raymond’s solo show explores the dynamic between technology and our natural world, and represents the first part of Schematic: New Media Art from Canada, a group exhibition opening in London later this year. The initiative behind Schematic is to create an opportunity to present Canadian media art to London audiences and to open up new opportunities for Canadian artists. Schematic looks at the idea of “the artist as engineer” where the artist is also an “inventor” engaging with technology. At the same time, the artists and their works present a “Canadian” vision and perspectives, addressing ideas such as the relationship of nature and culture, climate, landscape and national mythologies.